Cut a hole into the hawaiian rolls large enough for meatballs to fit on the top of each roll. Add minced garlic and chopped parsley to melted butter. Brush the mixture to each roll. Toast rolls in oven until golden brown, about 10 minutes. Meanwhile, make meatballs. Put ground beef, parmesan, oregano, salt, and pepper into a large bowl, mix until evenly distributed. Roll 12 meatballs. Heat olive oil in sauté pan on medium heat. Brown meatballs on all sides and add jar of sauce. 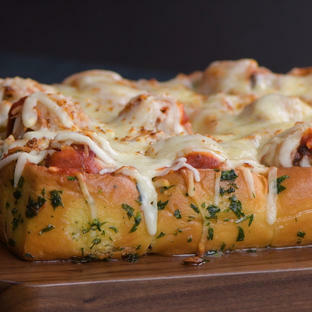 Place each meatball and a tablespoon of sauce into bread hole, top with shredded mozzarella. Place back in oven until cheese is melty.